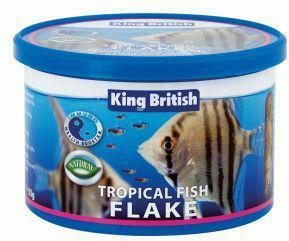 King British Tropical flake 55g Complete diet for all species of tropical fish. Promotes colour, condition and vitality. Feeding a high quality diet is essential for keeping your fish healthy. Not only does it directly affect the health of your fish, it also affects the quality of the aquarium or pond water. Feeding a high quality diet will ensure your fish receive all the essential nutrients such as fatty acids, vitamins and trace elements that they require to maintain a healthy immune system. In addition, feeding a high quality food will mean that more of the food is digested by the fish and less is excreted into the water as waste therefore helping to maintain good water quality.